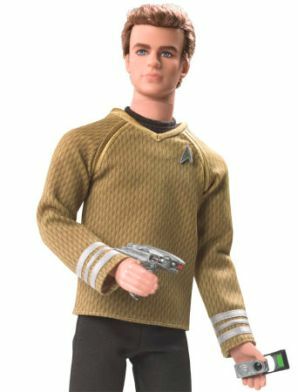 This year marks both Barbie’s 50th anniversary and the flashy 90210 reboot of the Star Trek movie franchise, and what better way to celebrate these two awesome moments in our cultural development than a Barbie Girl/Star Trekkin’ mash-up? It wouldn’t be much of a Barbie range if they didn’t have a Barbie, of course. 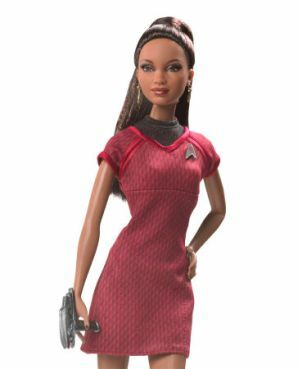 There has been a Star Trek Barbie before - a perky blonde in a Starfleet tunic - but in keeping with the fact that they’re basing the Barbies on the movie actors, and based on the fact that there’s really only one woman in space in the future (because someone has to answer the phones - ah, the future), Mattel had to do something it doesn’t normally do. Black Barbie. As a likeness of actress Zoe Saldana, this is actually not too terrible. In fact, compared to the other two dolls, this one looks like a runaway success, but then I suppose the people at Barbie probably are better at making Barbies than Kens. 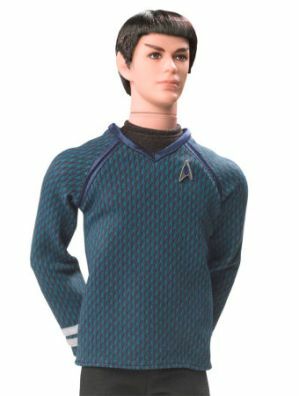 So there you have it, the new Star Trek Barbies. No word yet on whether or not they’ll follow it up with Wolverine Barbies, but I’m first in line if they do.